Car lover or not we all have heard this name, one of the leading brands amongst the automobile industry Lamborghini! Yes, there is a whole museum dedicated to the skillfully structured cars and for all you car nuts a visit to the factory can be arranged with prior booking. Started in 2001 this museum is operated by Automobili Lamborghini S.p.A. The museum is divided into two levels adjoining the museum is Lamborghini’s factory. The first level has a number of cars lined up one after the other displaying different decades of pure brilliance. Second floor has all the race cars and concept cars of Lamborghini crafted during 1980-1990 along with a huge window that gives a glimpse of Lamborghini’s factory. It is a complete heaven for the automobile enthusiasts to witness a collection which is, for the lack of words, a class apart! The beauties showcased in the museum will leave you wanting more, one can get a guided (English speaking) tour of the factory and get glimpse of the skilful engineering used in making these cars. Stop caring about the Lamborghini Museum ticket prices and grab the Lamborghini Museum tickets for its time to take a ride around the racy city of Bologna. Tickets for Lamborghini Museum listed in the tours and tickets section come with a sound guide who brings out the best of the sporty beasts with his impressive storytelling skills. 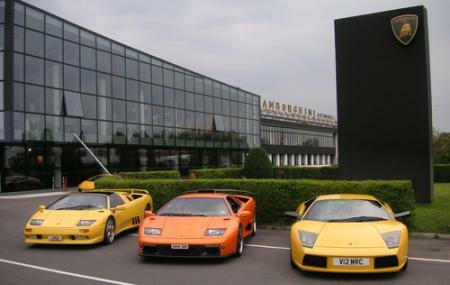 Buy tickets for Lamborghini Museum immediately as they sell out as fast as the cars themselves! Camera is not allowed in the factory. Kids below 6 years of age are not allowed in the factory for security reasons. Book the factory tour well in advance. Make sure to park in a secure parking zone. Locker facility is given to keep your belongings. Children aged 6-10 are allowed free. How popular is Lamborghini Museum? People normally club together Museo Ducati Or Ducati Museum and Parrocchia Di Savignano - Chiesa Di San Marco while planning their visit to Lamborghini Museum. Must see when visiting this area! So interesting! Take the factory tour. We had a very knowledgeable tour guide. Well worth the $75pp entry fee. There are no photos permitted inside the factory. Amazing. Beautiful. Took the trip to the factory and I recommend it 100%. They show absolutely everything; you spend 50 minutrs inside the fabric where they pass you through the complete line of assembly of the cars. REALLY WORTH IT if you are a fan of Lamborghini! Cool. Its just a hevan to me. Now my one misunderstand about lab is not more. Only lab is best. In the world. Wonderful museum if you like Lamborghini. Who doesn't?! Two floors of cars and history, and right there at the site of manufacturing of models such as the Huracàn and Aventador. Spend the extra money to do the plant tour, well worth the experience to see how these amazing automobiles are meticulously crafted. Photos allowed in museum, but not during tour of factory.